How underground cable locator works? Before locating a fault in an underground cable, it is necessary to know the route of the cable. How can you locate a fault when you don't know where the cable is? Sometimes you may find maps of the cable routes in the documentation (and that is why a good documentation is necessary for every work). But, when you don't have the map of the cable route, you need to locate and trace it. Locating underground cable is necessary not only for finding faults, but also for undertaking any excavation possibly near a cable route. This article will explain the types of underground cable locators and how they work. Active Location: This method involves locating a specific line/cable by means of injecting specific frequency signal using a transmitter and the tracing it with a receiver. Passive Location: This method involves looking for unknown lines by detecting electromagnetic field with the help of a detector or receiver. Though the passive location method does not allow us to distinguish between the type of line, it is necessary prior to an excavation work. Some underground cables may already be energized and, hence, can be located by scanning for their electromagnetic fields. Non-energized underground utilities or cables may be located by scanning re-radition of signals induced on the utility by a radio transmitter. A cable locator generally consists of two modules - a transmitter and a receiver. A transmitter is basically an AC generator which supplies the signal current to the underground cable to be traced. The signal can be usually set to a specific frequency by the transmitter. This signal creates an electromagnetic field of the same frequency around the cable which can be then detected by a receiver. 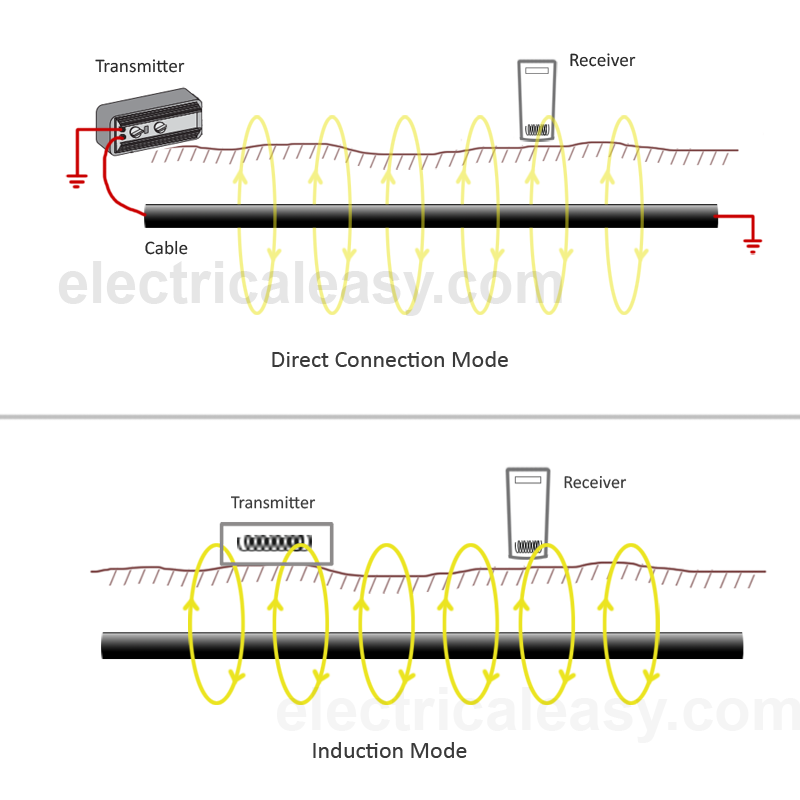 Signal can be transmitted into the cable either by direct connection method or by induction method. The direct connection method is the most efficient way of applying a signal to the cable and should be used wherever possible. In this method, the transmitter is connected directly to the cable at one end while the other end is grounded to complete the circuit. While in induction method, there is no need to make any physical connection to the cable. It transmits the signal by inducing it electromagnetically from above the ground. A receiver detects the electromagnetic field created by the transmitted signal around the cable. The electromagnetic field can be detected above the ground at the top of the cable. A receiver can also be set to detect electromagnetic field of already energized cables (as in passive locating). There are basically two types of cable locators depending upon frequency of signal - single frequency and multiple frequency locators. Single frequency locators, as their name implies, are able to produce a signal at only one specific high frequency. These locators are well effective in noncongested areas where very cables or utilities present under the ground and are distinct from each other. Since high frequency tends to induce into everything that is conductive under the ground, it may produce distorted signals for the receiver. In other words, a high-frequency signal may get induced into a nearby gas pipe or communication line, making it difficult to distinguish the cable. Copper, aluminum, iron, each metal respond better to a different frequency. A multi-frequency locator helps you to tune the transmitter frequency according to the material of the line. This makes it easy to distinguish between whats needed and whats not. Multi-frequency locator also helps in making the task easier. Higher frequencies are better for picking up more signals while lower frequencies make it easier to follow a particular line. Many tracers or locators are available that detect 60 Hz or 50 Hz frequencies. These locators allow tracing of energized cables.